Longtime British comics fan and indie publisher David McDonald, whose projects under his Hibernia Comics imprint include One Eyed Jack and the Death of Valiant and a fab Doomlord strip collection, writes to tell us he is busy working on his next Comic Archive title, provisionally titled Beyond 2000. In the process, he's gathered a motley assemblage of interesting material, some of it he's unable to find space for in the final Archive - so is instead running items of note on his blog and Facebook page, starting with this fascinating piece about the 1970s Vulcan comic, which he's kindly given us permission to publish on downthetubes. Vulcan was a weekly comic published by IPC from 1975 to 1976, reprinting strips such as Mytek the Mighty, Trigan Empire and Steel Claw from other IPC titles. 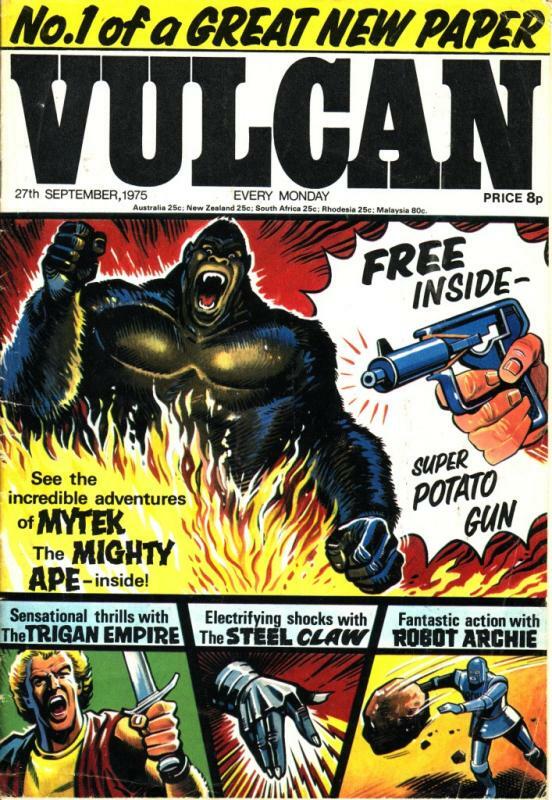 Unusually, the comic was originally published only in Scotland, but switched to nationwide publication after 30 issues, lasting for 28 more issues before merging into Valiant. Bizarrely, longtime editor Dez Skinn, who was working at IPC when Vulcan was published, tells David Vulcan wasn't really an IPC product. "In his spare time [Valiant editor] Sid Bicknell put it together editorially for Europe, with Jan Shepherd as art editor. "It came about because Syndication International was making an absolute fortune for IPC by selling Fleetway strips abroad," Dez reveals, "even though their success was foolishly never costed into the viability of titles. So some bright spark had the idea of selling an entire comic to foreign publishers, instead of individual strips. The big gimmick being the low cost price to each because they'd all be printed at the same time (in Italy, I think). "So it was an early co-production for various countries (hence all the words, including the cover masthead were in black, so the fifth (language) plate could be changed easily when printing all at the same time for different languages without need to change any of the colour plates. They'd print off from the full four colour plates for everybody including a black artwork plate, giving it a print run beyond a million, then overprint different languages from a second black plate, a different one for each individual territory. "This way, you could have a full colour comic, even in a territory which could only support a print run of only 25,000 or so. (Very cost effective). "Because it was so cheap (and nasty, on horrible flimsy paper which usually fell apart at newsagents), it was an easy job to run-on copies in English for the UK with a ridiculously low breakeven, provided it sold well enough abroad to keep going. I seem to remember the German edition, Kondor, proved very popular. "But it wasn't liked in-house, not being a "proper" comic, with no full time staff or any origination, and on that awful cheap paper! Everybody felt it undermined their work, being a cheap little reprint, the thin end of the wedge, and Sid and Jan weren't very popular for agreeing to do it. ... so now you know!"